I read this article soon after it was published in 1971. Free energy from the sun, free insulation from the earth and free shade from plants. From Mother Earth News July / August 1971. I should say here that I am neither an architect nor a builder. I had been a university professor up North until I left to experience the world’s basic kind of life and my wife had been a librarian. We took the Community plunge not knowing how we would make a living until my wife got a job driving a bookmobile, and eventually became an outstanding regional librarian. 1 worked on the place . . . and wrote. Our 32-foot x 24-foot shed-roof dwelling was a moderately solar house. But its main feature was a slot between floor and wall — on all four sides—that drained cold air from the walls down to the deep, completely dry, sealed cellar. The living room was 32-feet long and 11-feet high at the front. The 3-way divided bathroom had wooden partitions and the two bedrooms could be enclosed with drapes. We used the smallest Riteway heater in this house and our fuel was the wood we got from clearing. We spent not a cent on fuel. On the coldest winter mornings (temperature around zero) with no heat in the heater overnight, the temperature in the living space was about 50 degrees F. A fire built in the heater would raise the temperature to 70 within ten minutes and, at 9 in the morning, we would let the fire go out. The sun would then take over and keep the temperature of the house above 70. 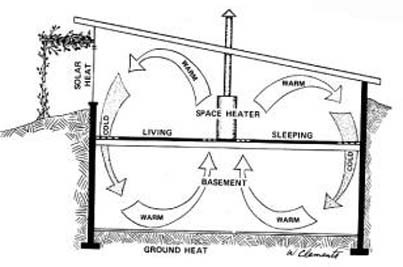 When the 4-foot deep crawl space for the house was dug, I solved the problem of earth-pressure on the north and west walls by leaving a strip of earth 6-foot wide within those walls and by reinforcing the 8-inch cinder block masonry. When the house was finished, the earth around it (which we covered with honeysuckle) kept the dwelling warm in winter and cool in summer. The house had no openings to the cold north but there was a block-sized ventilator at the west (near the ceiling, next to the north wall), with an air passage through the house to a companion ventilator in the east. The west wall extended 4-foot beyond the south wall, to keep the winter’s cold west wind off the south wall and windows. Near this extension was a sheltered doorway in the south wall. Another doorway was in the east wall. near the north. The south had three large and two smaller windows. The east had one large window, over the kitchen sink. There was door glass, and glass in the storm door. The shed-type roof, with a pitch of 1 to 8, was supported by framing and insulated with conventional insulation. The roof sheathing was good 2-nches matching lumber on 4-foot centers of 6-inch unfinished rafters. The rafters rested on a 10-inch double beam running through the middle of the house from east to west. This beam rested on the walls and two posts. The ceiling was one-half inch sound-absorbent insulation board over conventional insulation. The roof sheathing was covered with roofing felt which should have been painted with aluminum coating for reflective insulation. The roof itself was crimp aluminum. I think corrugated aluminum would have been better for both reflective insulation and hot air drainage in the summertime. The masonry walls were waterproofed outside with 2 coats of 1/4 inch cement plaster plus 2 coats of cement sealer. We insulated the living area walls inside simply by nailing on insulation boards with ordinary nails. We painted the boards Ripple Green. The virtue of the shed-roof is to promote interior air circulation. The warm air goes up to the highest level, which is at the south. There were two transom windows—one at each end of the high south line—near the ceiling, to let the hot air out in warm weather. The two ventilators, the two doors and the two transom windows gave us plenty of ventilation. The roof-overhang on the south side kept sunlight from the main windows in June and early July. But during the heat of late July, August and early September the sun was low enough to shine in. To prevent that, I constructed a three-foot wide frame above the windows on which wires were stretched parallel to the south wall. Grapevine and woodbine were easily trained to cover this trellis. Their leaves sheltered us from the sun’s rays and the respiration of the leaves cooled the air. In the fall, when sunlight was welcome, the leaves dropped off. The main windows were fixed and well insulated. The panes were all “double strength”, one-eighth of an inch thick. I sealed the inside pane and left the outer one unsealed—like a storm window without a frame—by setting the glass against four little 1/2 inch blocks. Each block was nailed with one little nail and the pane of glass was fastened with another four nails. The air between the panes is non-humid outside air and does not fog. “In Sunnycrest, on the coldest winter morning, the temperature was 50 degrees; on the hottest summer afternoon, 85. In Sunnycave, on the coldest winter morning, the temperature was 60; on the hottest summer afternoon, 75. For that reason I prefer Sunnycave. Its temperature varies only 15 degrees throughout the year!